Snow reason not to run! On Sunday I had a notification from Garmin connect- I don’t tend to check it much as I use Strava for runs, but I keep an eye on my steps (still on the 10,000+ per day goal streak from July). 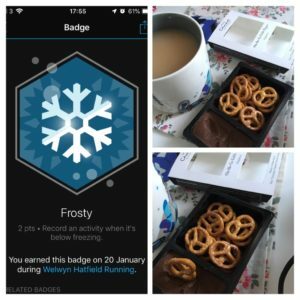 Anyway, during my long run the temperature was below freezing so I earned a Frosty badge. I had some work to get on with and it gets cold sitting still in my office, so I had a cup of tea and found these chocolate pretzels in the cupboard (as with most things, I’d bought them and saved them for a special occasion whatever that means). It was so cold that the dipping sauce was solid, so I had to sit the pot on top of my tea to melt it a bit first! On Monday after work I was meeting a friend in town for dinner. I had a few jobs to do first, including taking some old bras to a bra bank. I had sorted some out a while back when clearing out drawers, and then found them again after the Marie Kondo inspired tidying. I know that ages ago someone at work had collected some to be sent off to places where bras are too expensive for lots of people, and after a bit of googling I found this website where you can look for local bra banks. There was a local listing of a care home, but when I did a detour past it on a run the other week, the care home was closed (looking rather derelict), and the next closest one was the Wonderbra shop in the Galleria and randomly someone posted about that on our running club page to say it was closed, so I emailed the charity and asked them if they knew of any that were open. There was an office in the town centre with a collection, although it was an office with a shared door (where you buzz the button for the right one) so I did feel a bit strange standing in the street holding a bag of bras. Luckily the lady who opened the door knew what I was talking about. Anyway, we met at Bill’s and I tried their new mushroom and beetroot burger, but I was a bit disappointed with it- it wasn’t very beetroot-like and was more like a veggie burger you’d get in a supermarket. The sweet potato fries were still as good as always and of course it was lovely catching up with my friend. On Tuesday morning I had a bit of a car disaster- when I’d got back on Monday cars were already starting to ice up, so I put the cover on my car as usual (it’s a proper cover with bits for the wing mirrors and little catches to attach it to the hub caps). Anyway, it had rained overnight and then got cold, so the cover was stuck to my car. I thought with a bit of yanking it would come off easily, but it was really stuck and even though I ripped the cover in places it was still stuck. I tried spraying it with some anti-freeze in the hope that it would undo it, and after about 10 mins got Andy to help me, because I was managing to unstick it in places but then the car was so cold it was freezing again to new bits of the car. There was no way I could have driven because it was stuck to the windscreen too. After about 20 minutes Andy managed to get it all off but it left loads of weird blobs all over my car that looked like giant bits of chewing gum. I left so late and then the traffic is always so much worse so it was a bit stressful- I only just made it to work before the gates get shut. After work I had a meeting and during the meeting it started snowing- not too hard at first but then it started settling on the grass, and then on the car park and pavements. The traffic was pretty bad by the time I left, but as I neared home there was less snow and more sleet, so I wrapped up nice and warm and headed out for a run (I thought it would be my only chance to run all week). 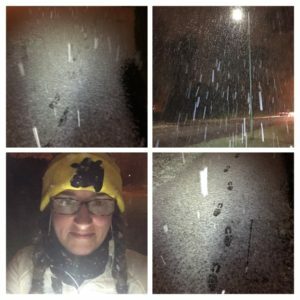 At first it was a bit sleety and I had to be careful because the pavements were a little slippery, but then after about a mile the snow started coming down pretty heavily (I had to keep stopping to brush it off my glasses because it was sticking to them and I couldn’t see). I kept taking photos and took it very slowly, but towards the end once the pavements were thick with snow it was much easier again. 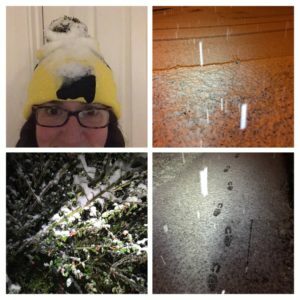 When I got inside a huge blob of snow fell off my hat, and when I caught sight of it in the mirror it made me laugh so much because it was totally covered in snow still. 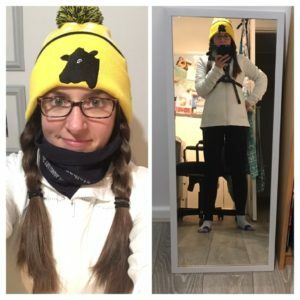 It had kept me nice and warm though- that’s the first time I’ve run in a proper hat and I did like it (for when it’s that cold) although plaits when running are so annoying because they bang up and down on my shoulders the whole time. I’m not sure how else to do my hair under a hat though and there’s no way I can run with loose hair (I know some people do, but it would drive me mad). Anyway, home in the warm and Andy had put the fire on so it was lovely and cosy. The snow had properly settled on the roads but it must have warmed up overnight because although it was still on trees and fields, even the side roads were clear. On Wednesday we had a message to say yoga was cancelled because there was a problem with the heating in the hall- doing yoga in there without heating would have been awful in the freezing cold weather, so when I got home I headed out on a bonus run, doing about 4.5 miles. 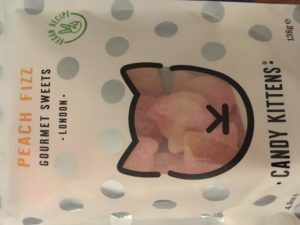 On Thursday we had booked tickets to see Mary Queen of Scots, so I packed some of these peach sweets as a cinema snack- they are so tasty. I did enjoy the film, but I think that after watching The Favourite and then Colette I am reaching saturation point over historical dramas. I did feel sorry for Mary at the end (no spoilers of course because it’s history)- a little like how I felt towards Anne Boleyn after watching The Tudors. Did you have any snow this week? Do you still run if it’s snowy? I think icy weather is much worse- I’ve had runs before that turn so slippery that I’ve had to aim for verges or just walk so much of them because of super thin ice. Author Maria RunsPosted on January 25, 2019 Categories General ramblings, Running, Stuff I love! We only had a brief flurry of snow but the temps were so low most of the week that it was icy and slippery most of the time. I was able to run but mainly on roads (stepping onto the pavement if a car came) and at a slower pace. I would have preferred snow as when it’s fresh and soft it’s so much better to run on. Yes, the icy pavements are the worst- so much harder to keep traction with. I hate running with plaits too – it is so annoying them flying about the place and invariably hitting me in the eye. But under a hat it’s really the only way. Well done for getting out in the snow. It’s generally OK as long as it’s not icy or slippy. You just have to be careful of hidden curbs! You do have to be careful of curbs- luckily I had on my torch so I could see the dips more clearly. We didn’t have enough snow for a snow day- here’s hoping! The car saga sounded a bit of a nightmare. Ours has a very efficient defrosting system so it usually only takes a matter of minutes before it’s OK to drive it. Would a pony tail work re running with a hat on? The ponytail gets squashed by the hat so even if I just put it on at the end of a run I get annoyed by the hair being squashed onto my neck and itching me. I need a hole in it for the hair I suppose! Previous Previous post: A parkrun, pancakes and afternoon tea- the perfect weekend right there!